Katie has used the First Edition doily die to create her very own stencil and a variety of embellishments to show that contrasting textures can complement each other on a layout. 1. For my 12” x 12” Santoro Willow pearlescent paper, I have picked the doily die. I would recommend having a rough idea where you would like to apply the textured paste onto your layout to avoid any mistakes. Once you have decided, place your doily on the paper and cover with a textured paste, when you remove the doily die you will have the shape of the doily print left. I applied the print mainly around the centre of the layout with one print added on the top left of the paper. Tip: To clean your die sets, use warm soapy water and a cloth. 2. Once the paste has dried, I spritzed some magenta DecoArt mister around the page and removed the nozzle from the black DecoArt mister to add a few droplets around the layout. Leave the acrylic misters to dry. Tip: If the paper bubbles up, spray water on both sides and dry with a heat gun to flatten down. 3. I picked the distressed pink paper from the SANTORO®'s Willow A4 paper pad and cut it to an 18.4cm x 8cm rectangle. With a pair of scissors, cut the corners into curved edges and add to the top half of the layout. I then cut the brown decorative paper to 8.5cm x 2.5cm and stuck it to the top of distressed paper. 4. Cut two doilies in half and with one half, cut again to create quarters. Layer one of each quarter together with double sided tape and add to the top right and bottom left of the distressed paper. I added a dusky pink paper flower to the bottom left doily halves and finished with a small pink resin flower. 5. I have planned to add my 9.1cm x 12.1cm photo to the centre of the layout so I cut the SANTORO®'s Willow heart paper to 13.5cm x 10.7cm. I have then cut the paper with the Fiskars Fancy Edge Deckle scissors to create a decorative frame for the photo. Stick the photo to the centre of the layout with foam squares. 6. Cut a wooden frame in half using scissors and tuck the one frame under the top right of the photo and add the other under the bottom right and glue to the paper. 7. I then cut up strips of the lace patterned paper from the SANTORO®'s Willow A4 pad and tucked two to the bottom half of the photo on both sides. Cut scraps of the heart paper with the Fiskars Fleur Border Punch and stick on top of the lace paper strips. 8. Die cut two lots of tickets using the Fun Fair ticket die with the SANTORO®'s Willow pink polka dot and heart paper. Staple three tickets to the top right of the layout and add a cut out strip of the lace pattern paper on top. I added two remaining tickets either side of the photo. 9. Take the doily halves you have left over and layer them on top of each other and stick to the bottom corner of the page. I have cut another lace patterned paper into a strip and layered on top of the doilies to cover the cut edge. Cut a paper blossom in half and stick the two halves together and stick to the left of the lace paper strip. To decorate, add a resin flower to the centre. 10. I have added a SANTORO®'s Mirabelle metal corner to the top left and bottom right of the photo frame and glued a coordinating resin flower to the centre. I then added some glitter stickers to the opposite corners of the frame and next to frame on the right. 11. To complement my colour scheme, I used the Dovecraft pink ink and stamped the sentiment ‘Beautiful Moments’ on to a piece of plain white card. Cut the sentiment to size and add to the left of the layout using foam squares. 12. As a finishing touch, add a SANTORO®'s Willow metal pin to the top right of the photo frame and glue black sequins in a variety of sizes around the page. 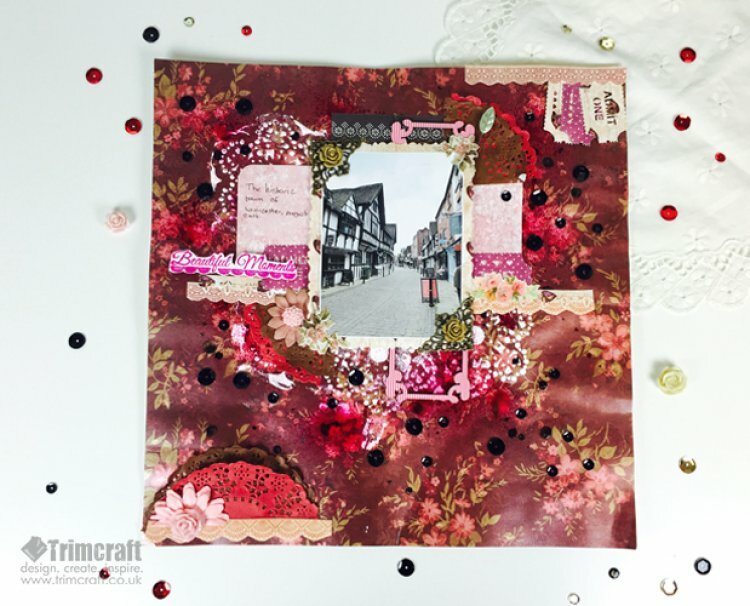 Has Katie’s scrapbooking tutorial inspired you to add texture to your own layout? Share your scrapbooking creations with us in the Project Gallery.